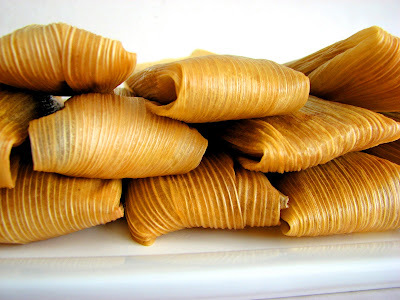 Tamale making is a Christmas tradition in Latin America and in many areas of the West and Southwest, but I’d eat them any time of the year. There are so many versions of tamales from different regions and among different sub-cultures and each are delectable in their own way. 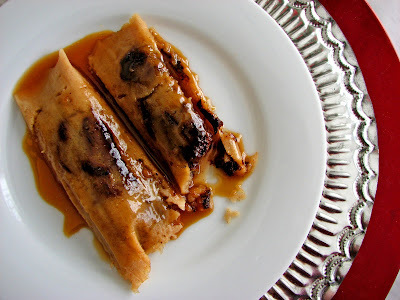 Since I’ve never made tamales before, I thought I’d get into the spirit and put together a dessert tamale that has all the wonderful flavors of Latin America. 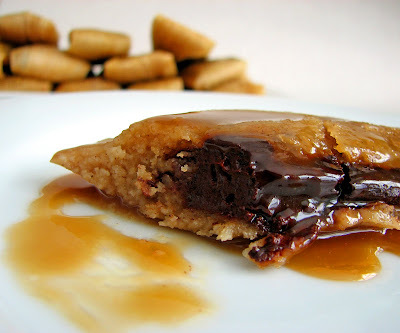 I've tucked a ganache of earthy rich chocolate, cinnamon, almond and chile powder into a lightly sweetened corn dough or “masa.” The tamales are served with a drizzle of light caramel sauce to finish the plate with a final note of allure. These tidy little packages deliver a festive combination of flavors from both the New and the Old World. 'Tis the season. ¡Felicidades! - I’ve used Maseca brand masa instantanea de maiz since it seems to be widely available. - To make the ganache, chop the chocolate into very fine bits so the melting process is thorough and even. Once you pour the hot cream onto the chocolate, let it sit for about 2 or 3 minutes, then stir very slowly so you don't cool down the mixture too quickly before all the chocolate has a chance to melt. - You can make the chocolate filling ahead and refrigerate. 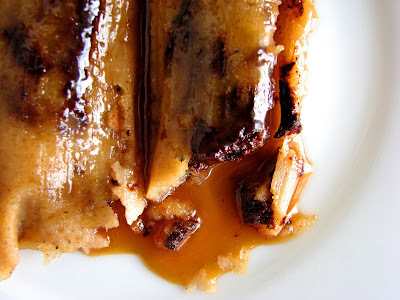 The caramel sauce can also be made ahead or while the tamales are steaming. - For the purposes of planning ahead, it takes about 15 minutes to make the ganache and an hour or so to chill; an hour for the corn husks to soak; about 20-25 minutes to mix the dough; about 45 minutes to 1 hour to assemble; and approximately 2 hours to steam. Chop the chocolate into very small fine pieces and place in a bowl. Gently heat the cream, spices and honey until just before it comes to a boil. Remove from heat, stir in the extracts and pour over the chopped chocolate. Let it sit for a couple of minutes. Using a rubber spatula, gently and slowly stir the center and then slowly work out in concentric circles. Blend until there are no streaks and the mixture is smooth. Pour into a clean container and cool completely. Cover and refrigerate for an hour or two until firm. Soak the corn husks in large bowl of very hot water for 30 minutes. Weight them down with a heavy bowl or saucepan to keep them submerged. Once they are softened, separate the husks carefully to avoid tearing. Continue to soak in hot water until pliable, up to 30 minutes more. Drain and pat dry. Bring the water, milk, salt, cinnamon and nutmeg to a slow simmer. Remove from heat and add vanilla. Gradually stir in the masa harina until it forms a very thick dough. Cream the butter, sugar and baking powder until very light and fluffy, about 3 to 5 minutes. Add the masa harina dough in small walnut-sized pieces, one or two at a time. When all the dough has been added, continue beating until it is smooth, fluffy and light, about 6 to 8 minutes. You can test to see if it’s ready by taking about a tablespoon of the dough and placing it in a glass of warm water. It should float. Place a dry corn husk on a clean work surface. Spread about a 1/4 C of the dough into the center lower half of the corn husk, leaving the upper half with the pointed tip free of any ingredients. Take about a tablespoon of the chocolate ganache, elongate it and place on top. Fold the long sides of the corn husk over filling, then fold the pointed tip over the filled half. Lay seam side down. Repeat the process until all the corn husks are filled. Arrange a steamer rack in large stockpot and add water to just below bottom of the steamer rack. Cover and bring water to boil. Place the tamales upright in the steamer, loosely leaning against one another. Lower heat to a simmer, cover and steam until dough is firm to touch and separates easily from the husk, about 1 1/2 to 2 hours. Keep a close eye on the water level to be sure there is enough throughout the steaming process. Melt the butter in a saucepan and add the sugar. Cook without stirring for about 2 minutes to dissolve and caramelize. Then, whisking constantly, add the cream and salt and continue cooking and for another 2 minutes. Remove from heat and add the vanilla. Add more salt to taste. In the grand and fairly populated Pantheon of Incredibly Stupendous Cookies, Sbrisolona surely has a very prominent place. Crunchy, chewy, crumbly, nutty and perfect for sharing, this is a recipe you absolutely can’t refuse. The endless crumbliness of it is half the fun and each morsel is irresistible. Sbrisolona originates from the Lombardy region of Northern Italy. Italian pastries are most often distinguished by their texture, lower sugar content and rustic simplicity and Sbrisolona is no exception. With lots of almonds, a perfect blend of simple ingredients and a slow even toasting in the oven, you have a crunch to end all crunches. It has just the right amount of sweetness balanced by a good pinch of salt. The butter adds flavor without lending any greasiness or fat saturation and the indispensable inclusion of orange zest makes it absolutely perfecto. 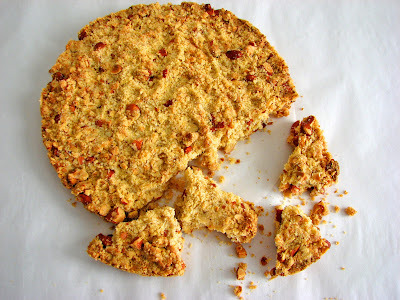 Sometimes called a tart, this wonderful collection of crumbs comes together in just a few minutes. It’s baked in a pan like shortbread, so there is no rolling or slicing or chilling. You simply combine the ingredients, gently coax them into a rough crumb and then pour into a buttered pan and bake. The tradition is to break it apart with friends. If you wanted to make a gift of it you could probably carefully cut it into slices, but my guess is it won’t make it out the door. 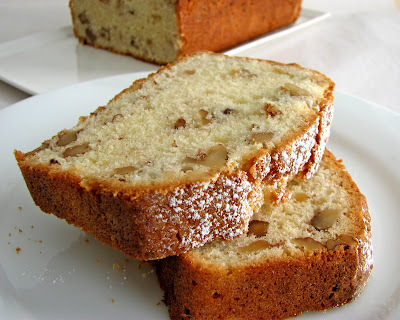 - I’ve also seen recipes that use semolina and orange blossom water, but this recipe from Suzanne Goin is perfection. 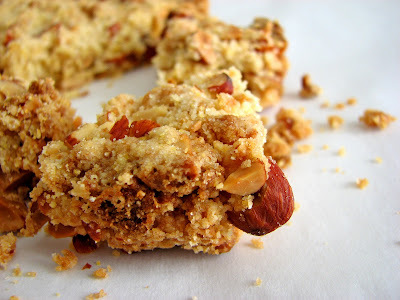 - Although the recipe says 4 oz or 3/4 cup of almonds, my 4 oz came to just shy of 1 cup. - In Italy, Sbrisolona is often enjoyed with Vin Santo, but would go with just about any beverage you favor. - Sbrisolona can be stored in an airtight container for 2 days. Preheat the oven to 350°. Butter an 8” springform pan. Toast the almonds for about 10 minutes until golden. Coarsely chop into bite-sized pieces. Combine the egg yolk, orange zest and the extracts. In another bowl, whisk together the flour, cornmeal and salt. Cut in the butter with a pastry blender or rub it in with your fingers until the mixture resembles coarse meal. Stir in both sugars and the chopped toasted almonds. Pour the egg yolk mixture on top and work it in gently with your hands. 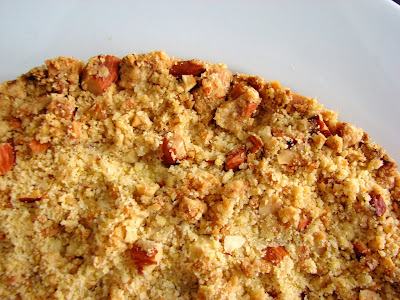 Be careful not to over mix; the dough should be very crumbly and look like streusel. Pour the crumbs into the prepared pan and very gently and loosely press the crumbs mostly around the edges and just very lightly across the top; the surface should be uneven and dimpled. Bake for about 40 minutes or until it is a deep golden brown. Transfer to a rack and cool completely before unmolding. Place on a platter and dig in. 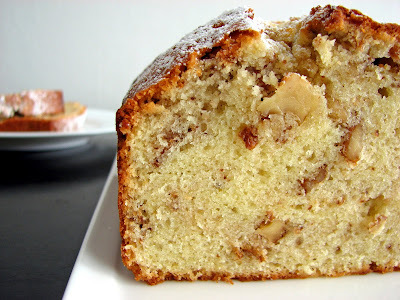 ‘Tis the season for festive cakes that showcase lots of nuts and dried fruits and spice. These are the kinds of cakes that date back to ancient times. For those who don’t care for the standard seasonal fruitcake fare, this is a nice substitute when you want something festive but not fussy or too heavy. With so many things to accomplish in the days ahead, a few simple and basic ingredients plus the addition of brandy make this a snap to put together and serve or present as a gift to your favorite host or hostess. - Toast the walnuts in a 350 degree oven for about 10 minutes, until they are only slightly darkened and give off a toasty aroma. 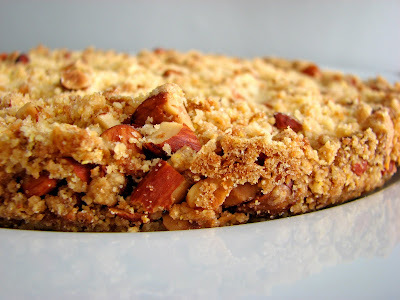 - If you’re not a fan of walnuts, substitute toasted almonds, pecans or hazelnuts. Toast and coarsely chop the walnuts. Cream butter and gradually beat in sugar. Scrape down the sides of the bowl and beat until light and fluffy, about 3 to 5 minutes. Add eggs one at a time, making sure that each one is incorporated before adding the next and scraping down the bowl as necessary. Alternate adding a third of the flour to the butter and eggs with 1/2 milk mixture, beginning and ending with the flour. Once all the ingredients are in, mix just a minute or so then finish the mixing by hand. Fold in walnuts. Pour the mixture into the prepared loaf pan. 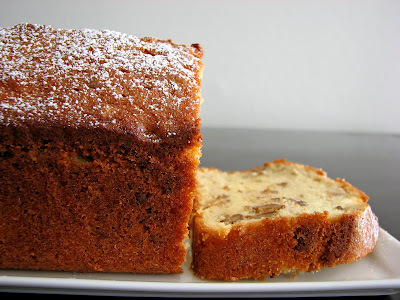 Bake the cake for about 50 – 60 minutes or until it tests done. Cool the cake on a wire rack for about 30 minutes. Remove it from the pan and cool the cake completely. Peel off the paper and dust the top with confectioners' sugar. It’s hard not to love the simplicity of sesame seeds. 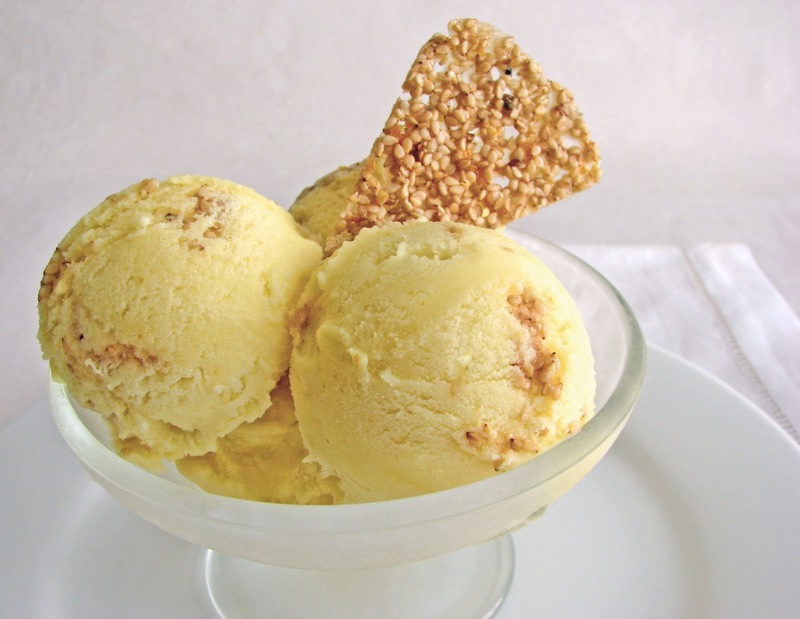 For this ice cream, I took some deliciously chewy Sesame Honey Tuiles and folded them into a vanilla ice cream base that is flavored with orange zest, a tiny hint of cardamom, honey and a splash of orange flower water. The result has a Middle Eastern feel to it but also seems like it could just as easily be discovered on the sidewalks of Italy. 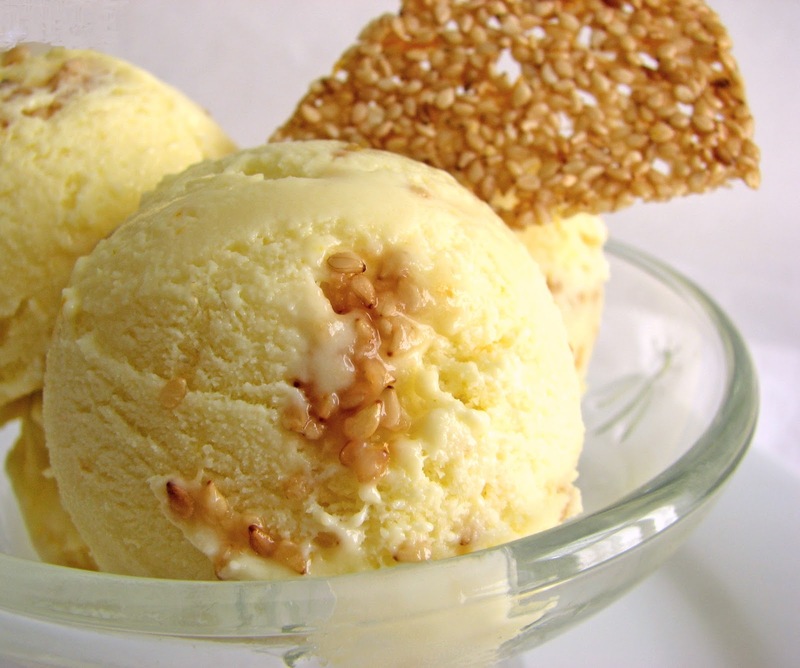 Whatever culture it recreates for you, I think you’ll enjoy the wonderful flavor and slight sweetness of the ice cream combined with the subtle but distinctive nuttiness of the sesame cookies, an indelible combination of flavors and textures in any world. Sesame seeds have a long and storied history. They are mostly familiar to us through the cuisine of Asia and the Middle East or as a garnish on breads and crackers, but they were first domesticated in India and are thought to be a symbol of immortality in some Hindu legends. 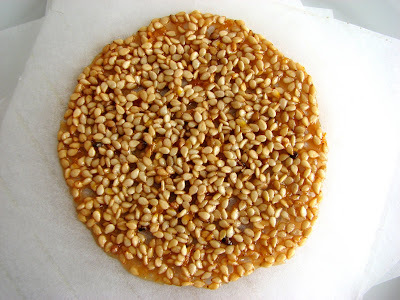 Sesame seeds were introduced in this country by African slaves and since the Mende name for sesame seed is bene or benne, you may find some pastry recipes from the south that use that term. These cookies are great on their own. They’re very easy to mix and they take just a few minutes to bake. Once they cool, they turn into light, crisp and delicate celebrations of the chewy lightness of sesame seeds. But I highly recommend the ice cream in order to fully enjoy the intriguing flavors of both as they mingle together in absolutely blissful harmony. - Tuile is the French word for “tile” and in pastry the term usually represents a light, thin, crisp cookie that is sometimes shaped like a roof tile. 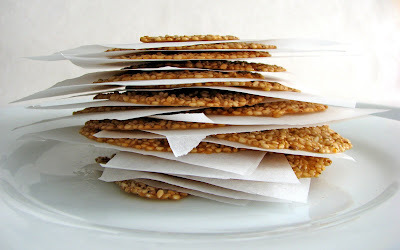 - The Sesame Honey Lace Tuiles are based on an old Gourmet recipe. I’ve reduced the sugar and added orange zest and a pinch of salt. If you're just making the cookies, you could also add some spice if you’re so inclined. - You can make the Sesame Honey Lace Tuile batter ahead and store in an airtight container in the refrigerator. Bring to room temperature before forming the cookies. - Chill the ice cream base overnight to let the flavors bloom. Combine the milk, cream, 1/4 C sugar, honey, cardamom pods, citrus zest and pinch of salt in a saucepan. Bring to a slow simmer over medium low heat. Turn off the heat, cover and steep for about 20 minutes to a half hour. When the flavor is right, remove the cardamom pods. Whisk the yolks with 2 T sugar until completely blended. Pour a bit of the warm cream mixture into the yolks, whisking constantly. Slowly add the remaining cream and return the mixture to the pan. Keeping the custard at a low simmer, cook over medium heat, stirring constantly until the custard is thick enough to coat the back of the spoon and leaves a clear trail when a finger is drawn through it, about 4 to 6 minutes. Do not boil. Strain through a fine-mesh sieve into a clean container. Whisk in the orange blossom water and cool completely. Cover the custard and refrigerate overnight. Coarsely chop about 1 C of Sesame Honey Lace Tuiles into bite-sized pieces and set aside. Freeze the ice cream according to your machine’s instructions. Fold in the chopped tuiles. Pour the ice cream into a clean container, press a piece of plastic wrap onto the surface, cover and place in your freezer until firm. Place confectioner’s sugar, butter, honey, water, salt and orange zest in a saucepan and bring to a boil over moderate heat, stirring. Boil for 1 minute. Remove pan from heat and stir in sesame seeds and flour until mixture is thoroughly combined. Cool to room temperature. Preheat oven to 350°F and line 2 baking sheets with parchment paper. Take half-teaspoons of dough, shape into balls and arrange 4" apart on baking sheets. Bake cookies in batches in upper and lower thirds of oven, switching position of sheets halfway through baking, 7 - 8 minutes, or until cookies are flat and golden. Slide parchment with cookies to racks to cool. Cool baking sheets a couple of minutes and line with fresh parchment between batches.